Color: White in color, ornamented with 3-4 spiral rows of moderately small, quadrate, rhomboidal or triangular, crimson-red spots on the penultimate and 15-20 rows on the body whorl; interior of aperture cream or light yellow in color. 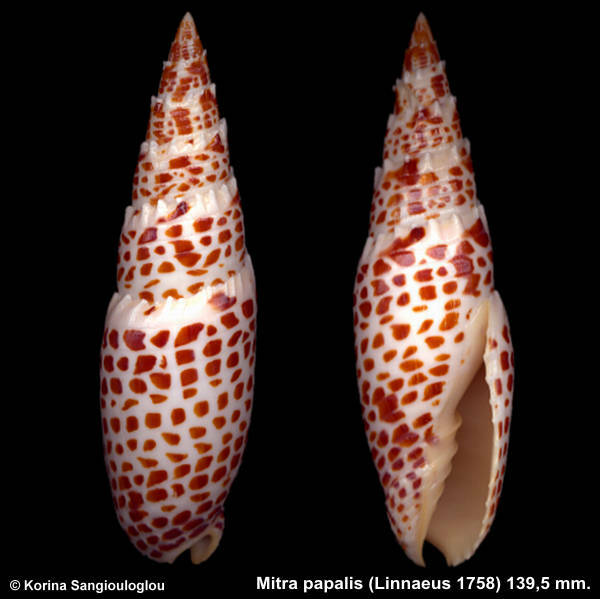 Shells about 6 ½ inches in length, elongate-ovate, solid and heavy. Whorls 8-9, apart from 2 smooth and white nuclear whorls, spire whorls slightly subangulate, post-nuclear whorls with 3-4 punctate spiral grooves which become weak on the penultimate and obsolete or absent on the body whorl. Sutures adcontours of the sutures. Aperture moderately wide, equal in height or longer than the spire, smooth within; outer lip thickened, perpendicular and crenate with small sharp denticles. Columella calloused and with 4-6 prominent, oblique folds, siphonal canal straight, obliquely corded and calloused, siphonal notch prominent.